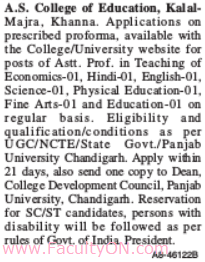 A.S.College of Education, Khanna has advertised in THE TRIBUNE newspaper for recruitment of Assistant Professors jobs vacancies. Interested and eligible job aspirants are requested to apply within 21 days from 09th October 2018. Check out further more details below. About College: Anglo Sanskrit College, Khanna is a post-secondary educational institution located on Khanna Samrala road near the village of Kalal Majra in Ludhiana district of the state of Punjab, India. It was rated highest A+ by National Assessment and Accreditation Council's. How to Apply: Interested and eligible candidates are requested to send application along with their CV, copies of certificates and recent PP size photo to the postal address provided here.